In 2002, when President Linda Reifschneider decided she needed to see Asian elephants on their home turf, she looked at the map and decided on Nepal. However, traveling by herself, to a country so far from home for the first time – and not wanting a ‘tourist package’ but to really see and be with elephants - she couldn’t figure out how. An opportunity in Thailand to help take care of two orphan baby elephants, bathe them in the river, and be taught how to ride like a mahout (on elephant’s neck) sent her in that direction. Sixteen years later: Nepal! The workshop attendees met in Kathmandu and the workshop was held in Chitwan National Park, a long, bumpy six-hour ride, but bordering the Trisuli River a good part of the way with the road hugging the steep foothills of the Himalayas, climbing up the hillside and then descending to the park borders. Paper sessions filled two full days and among the 25 veterinarians participating in the workshop were several we have had the pleasure to work with: Dr. Christopher Stremme, Sumatra, who presented on collaring and the responsibilities that don’t end once the collar is in place but last as long as the elephant is wearing it; Dr. Zaw Min Oo, discussed the options for elephants and keepers in Myanmar who now find themselves unemployed as logging with elephants is being phased out; Dr. Kushal Sarma gave us an update on EEHV in northern India; Dr. Pham Van Thinh from Laos; Dr. Arun Zachariah from India; Dr. Khajohnpat Boonprasert (Dr. Yeaw) from Thailand; and Dr. Bhaskar Choudhary, with the Wildlife Trust of India. 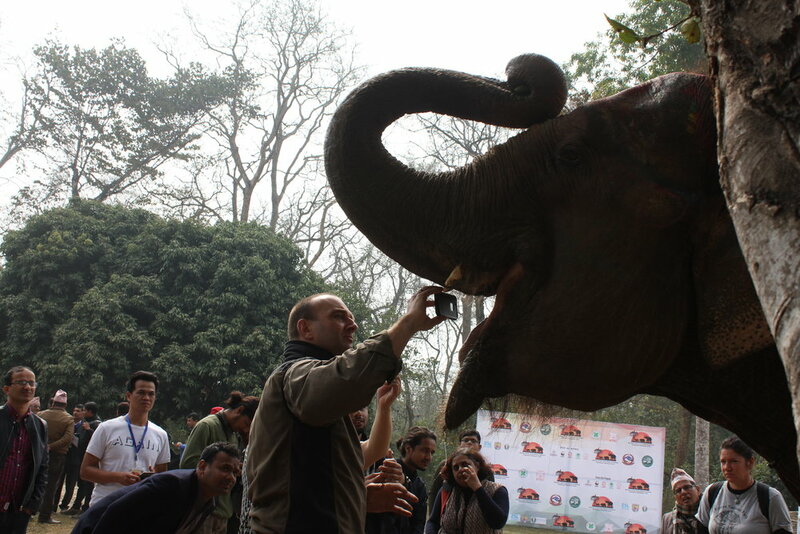 Also in attendance were veterinarians from the United States, Russia China, Mongolia and, of course, Nepal. Linda sincerely believes the ability to meet each other in person and be able to network with them is one of the best take-away benefits of these workshops. To have a name and phone number of someone who may be able to offer suggestions to a problem you have not previously addressed is a great way to grow the knowledge so necessary for the future of all wildlife. 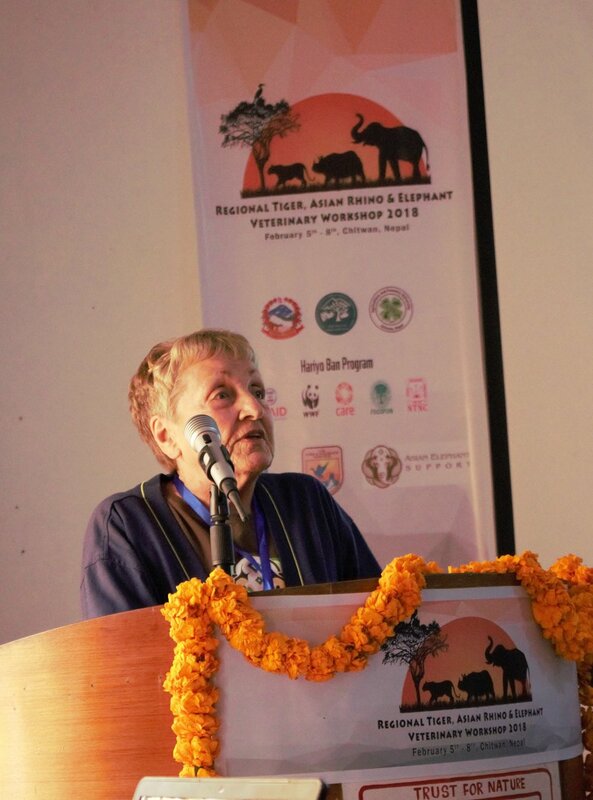 One attendee, working with the private owners in the Chitwan area, had an elephant with a ‘toothache’ brought to the conference grounds and visiting vets were able to examine her and offer the elephant’s vet and owner some various ways of addressing her problem. Our workshop ended with a canoe ride to visit the elephant breeding facility and a game drive in Chitwan National Park. We didn’t see any wild elephants, but a sloth bear danced across the road twice for our photographic enjoyment. Asian Elephant Support helped facilitate this workshop funded by the United States Fish & Wildlife Service and, as always, we extend our appreciation to our supporters who make it possible for us to help elephants in Asian range countries. Thank you!